In this young adult fantasy novel, teenage Varia lives in a settlement of transplanted humans who have escaped a polluted Earth to live on a distant planet. With half of their group missing and their crops failing, the settlers accept the help of Specto, the star child, a powerful entity who offers them survival — at a price. Varia is horrified by the strange transformation affecting the star child’s followers, but she has no idea what to do until she discovers a dragon’s egg. With a fully-grown dragon, Varia will be able to find the lost settlers and drive away the star child—but only if she can keep the dragon under control. Her quest is complicated when she too begins to change into something new. She must make difficult choices to save the settlers, the dragon, and herself. 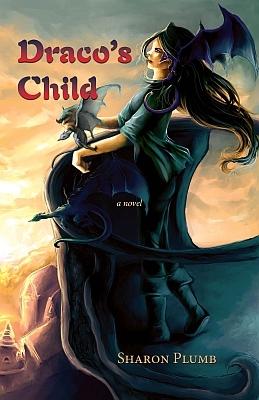 Draco’s Child explores what it means to grow up in a hostile world where the only constant is change, and what you become depends on what you believe. The novel explores themes of making decisions and recovering from bad choices, living in harmony with nature, growing up, and responsibility to family and community. See Reviews at Prairie Books Now, Amazon.com, goodreads, Star Phoenix, Saskatchewan Publishers Group. Order from Chapters-Indigo, Amazon.ca, or Amazon.com. Draco’s Child was a great book! Sharon Plumb has managed to create characters (both human and not) who are believable, flawed, and loveable, as well as writing a page-turner. For those of you who like original, solidly-grounded fantasy, this is a must-read. This entry was posted on September 29, 2010 by sharon in Draco's Child, Sharon Plumb Hamilton, Young Adult.